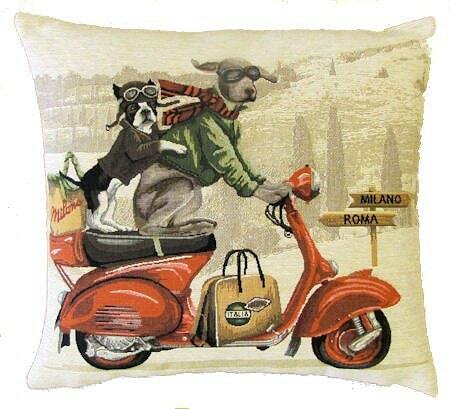 This whimsical tapestry pillow cover is one of a set of three cushions featuring different dogbreeds driving a Vespa scooter on Italian roads. It is woven on a jacquard loom in true traditional tapestry design – a craft that only a few master! The cushion cover is woven with 100% cotton thread and lined with a plain beige cotton backing. Size is 45x45 cm (18'x18'). We advise an insert of 50x50 cm (20'x20'), because we like our covers well filled. Insert not included. Closes with a zipper. Dry clean only. Handmade in Belgium. So lovely - I love this - thank You!!!!!! These pillows are simply amazing. I could not be happier! Very high quality material. Very pleased with the look & feel of the pillowcase. Note to reviewers: This is just a case, no stuffing included. Also, product shipped from Belgium, allow extra time for delivery. Beautiful! Ship fast and very nice seller!